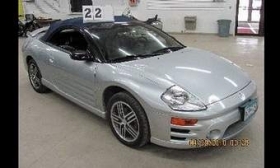 This 2004 Mitsubishi Eclipse Spyder is among the items from bankrupt car dealer Denny Hecker being sold at auction later this month. DETROIT -- Three cars, five Harley-Davidson motorcycles and five boats are among the items from bankrupt Minnesota car dealer Denny Hecker being auctioned off to raise money for creditors. The item list for the May 25 auction in New Germany, Minn., includes a 2004 Cadillac Escalade, a 2004 Mitsubishi Eclipse Spyder convertible and a 2002 Mitsubishi Montero SUV. This is the third sale of Hecker's possessions since last August to raise money for creditors. Hecker, who filed for Chapter 7 bankruptcy last June, owes $767 million to creditors.